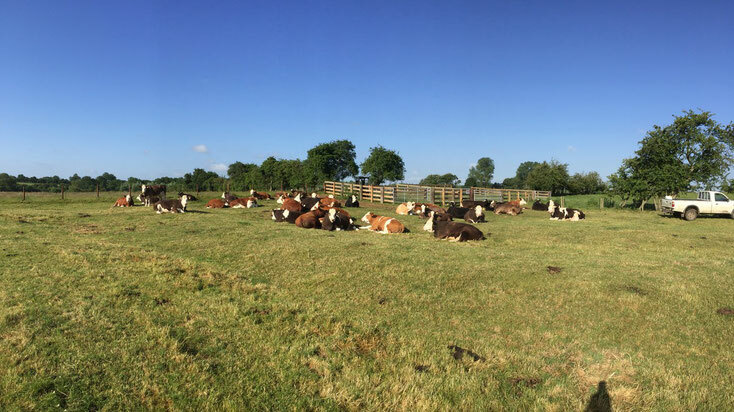 The commercial herd is a mixture of Hereford X, Simmental X, Aberdeen Angus X and Charolais X cattle, the breeding herd range in age from 16 to the younger group that all calve 2 years of age. All male calves born are used for meat production with the exception of the odd one who we think is good enough to keep as a commercial breeding bull (Rock Star was the first ever kept). They are all castrated in the first week of their life to make a steer, then raised for meat. Some animals go to our beef boxes with the others sold direct to the abattoir; the best animals are finished at about 16 months old with the Angus-cross and other Simmentals taking a bit longer. We use many of the females as breeding animals ourselves with the surplus either sold as a breeding animal if they' re good enough and if not these are also used for meat production. When they are young we use them as embryo recipients for our Red Angus embryos or they are artificially inseminated to make sure that when they calve at 2 years old it is an easy birth, they then run with Romeo so as he can then cover anything that fails to hold first time. Looking to the future we intend to sell in-calf heifers to other local herds.